There are two types of business books: the kind you have on your shelf and use for reference (usually boring, but look big and important when displayed) and the Malcolm Gladwell kind. Like most common readers, I prefer Gladwell’s style. Generally, you can read his books from start to finish, easily following the fluid narrative. 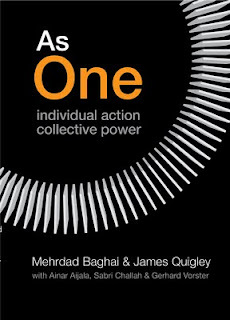 As One: Individual Action, Collective Power, written by Mehrdad Baghai and James Quigley, is a hybrid. The authors are prominent businessmen and their motive for writing appears to be increasing personal and professional eminence. So why would the common reader want to read this book? Since business books are essentially corporate self-help books, I try to harvest what I can from them to apply to my own life. As One is particularly dense with information on how our society is shaped and how our relationships evolve. We collaborate on a daily basis with co-workers, friends, family, and even complete strangers through social media. When tasked to lead the collaboration, our default method of leadership reveals a lot about us. 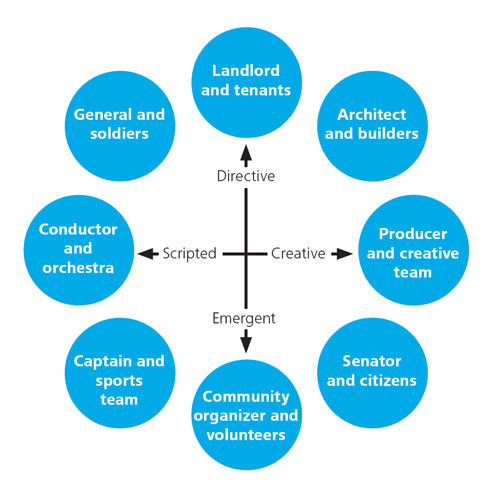 According to As One, there are eight archetypes of collective leadership: Architect & Builders, Producer & Creative Team, Senator & Citizens, Community Organizer & Volunteers, Captain & Sports Team, Conductor & Orchestra, General & Soldiers and Landlord & Tenants. (If you’re curious about which category you fall under, you can take a quick survey at http://www.asone.org/). Each chapter of the book is devoted to an archetype - providing real life case studies, offering a clear explanation and detailing guidelines on whether this archetype applies to you. The case studies are succinct and engaging, but the other parts feel dry and flaky, reminiscent of a government publication. As I took the literary tour through the leadership and collaboration processes of each archetype, As One forced me to reevaluate preconceptions. The terms “command and control” have become almost synonymous with unwanted dictatorships, but in reality some situations warrant this style of leadership. 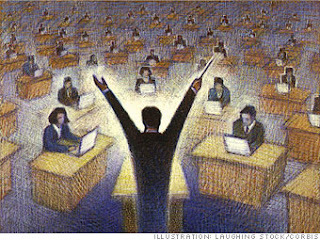 Command and control does not preclude collaboration. One of my favorite case studies is about Marriott Hotels, an example of General & Soldiers. The hospitality industry depends on a multitude of entry level employees to keep the premises clean and the service efficient. Marriott Hotels empower entry level staff to succeed by explicitly communicating expectations. Junior employees have all the tools they need (ESL classes, for example) to rise through the ranks. After all, every general starts out as a soldier. As a book, As One attempts to evoke meaning and inspiration. It is obviously a business book trying to appeal to the masses and while its meaning does appeal, I’m not convinced it inspires.